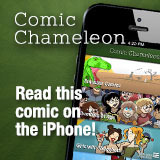 Dumbing of Age - Sweater vests! Back in Roomies! everyone wore the same outfit all the time because my art was primitive and it was easier to tell everyone apart that way. Also because that just happens in cartoons. It’s a done thing! But for Dumbing of Age, when I was starting to put this universe together, I wanted everyone to have several changes of clothes. And I wanted the changes of clothes to be thought out instead of a by-the-seat-of-my-pants sort of thing. That way lies blank colored t-shirts! So here’s some Joyce torsos that I brainstormed. 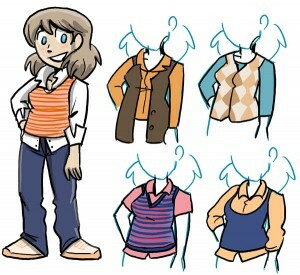 I want every character to have their own style, and Joyce’s is, uh, “sweater vests.” That’s even the name of the file. Not only does she wear a variety of sweater vests, but they’re also all using a certain range of colors that I’ve assigned to her. Orange! Pink! Brown! At this moment in time I haven’t yet put it into practice, as I’m about a month ahead on DoA strips and they all, so far, take place on the same day. Joyce is a little spoiled, but not so spoiled that she changes her outfit every other hour. This makes me think of Gus for Psych.